Previous posts in this series: Part 1, Part 2, Part 3, Part 4, Part 5. Once teams are satisfied their solutions are complete, they present them to a public audience. This audience should include all stakeholders: students, administrators, teachers, staff members, parents, other family members, community members, local business leaders, and elected officials such as school board members, city councilors, and state representatives. Experts the teams consulted with should also be included. During project evaluation, a minimum of these HQPBL principles are being practiced: intellectual challenge and accomplishment; authenticity; public product; and reflection. The audience participates in assessing the solutions and provides formal feedback to the teams. As such, this step serves as the summative assessment. How well do the project solutions respond to the driving question? How well do they fit within the identified constraints, such as cost and time? Magni-Science Audience Exhibit 2 – 2016 by Wikimedia Commons, shared under a CC BY-SA license. As a final step, the professional development participants reflect on the project successes; individually, within their team, and as a whole group. A preferred way to conduct group reflection is with a structured protocol. This ensures the reflection is purposeful and productive. All participants also reflect on ways the project design could be improved. This continuous improvement approach results in ever-better quality professional development. And there we have it. 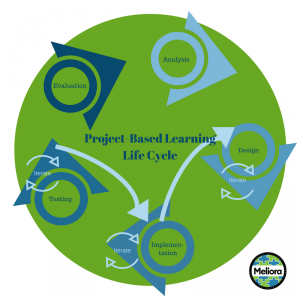 Our professional development participants have completed a full life cycle of project-based learning. Since they have applied the process to meaningful work, and have reflected on their work along the way, their understanding of the concepts, purpose, and steps of the process has increased. When they then use the PBL process in their classrooms, they will feel more confident and capable. Something we all desire in our professional lives. I would love to hear your thoughts on this process, how you think you could use it in your organization’s professional development, and of course, any suggestions for improvement!